The Chandra mosaic of a region of the sky known as the Lockman Hole (named after astronomer Felix Lockman, who discovered that this region of the Galaxy is almost free of absorption by neutral hydrogen gas) shows hundreds of X-ray sources. The high spatial resolution of Chandra allowed for the identification of many supermassive black holes in this image. 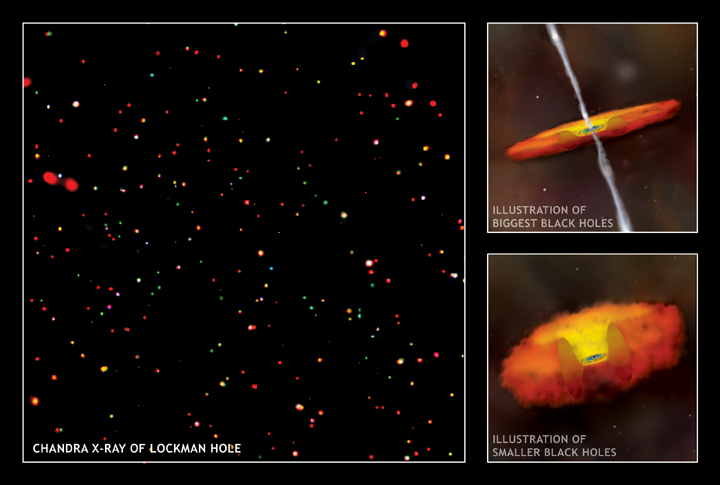 The Lockman Hole data and two other surveys with Chandra and the Hubble Space Telescope have provided a reasonably accurate census of supermassive black holes in the Universe. Astronomers have used this census to study the rate at which these enormous black holes grow by pulling in gas from their surroundings. Most of the largest supermassive black holes appear to have grown rapidly until they attained a mass of a few hundred million to a few billion Suns, and then, with few exceptions, grew no more. Their growth spurt, which occurred shortly after the first galaxies were formed 13 billion years ago, lasted for about 100 million to a billion years. In contrast, the supermassive black holes in the census that grew more slowly are still growing today. These supermassive black holes have masses less than 100 million Suns, and are much more common than the more massive varieties. 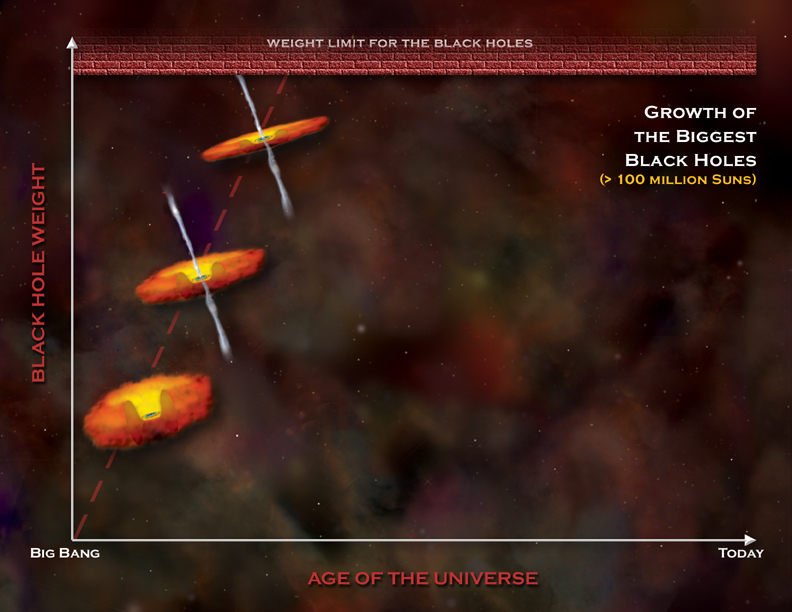 The more slowly growing black holes also tend to have more gas and dust around them (See illustration on lower right). This distinction may be a clue as to why the two types of supermassive black holes have different growth patterns. The extremely rapid growth of the most massive black holes could have created a blowback effect. Intense heating and the production of jets of high energy particles associated with large amounts of gas falling into the black hole could have cleared out much of the gas and dust in the surrounding area (see illustration on upper right). Without an abundant supply of matter to swallow, the black holes stopped growing. Scale Image is about 50 arcmin per side. Coordinates (J2000) RA 10h 34m 00.00 | Dec +57° 40´ 00.00"